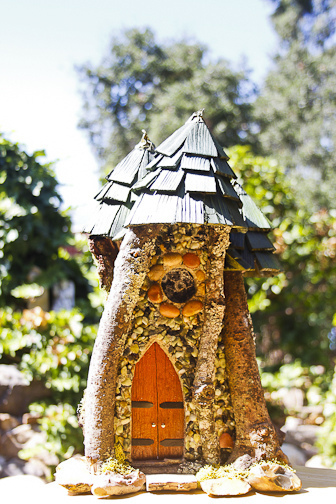 FairyCottages.com | Mysterious fairy houses. Doors that open. Fairy glass in all the windows. A removable roof. 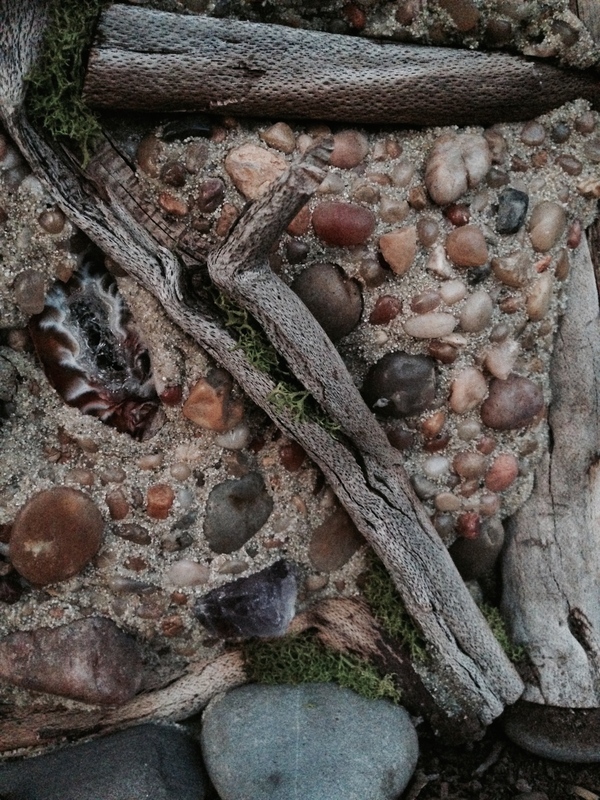 Just twigs, sand, pebbles, cedar, and…..fairies. Tidbit is a very small house. It tends to get lost in the shuffle of the larger cottages I make. But, it is adorable. I just finished it for the Merry Makers Artisan Faire at The Collection in Oxnard, CA on Dec 10 & 11, 2016. Tidbit is occupied by a woodworker fairy. You can see his preoccupation with gorgeous driftwood burls. There are two: one at the top of the front wall, and another that holds fast to a small pebble on the left side of the same wall. Available in my Etsy shop, here. 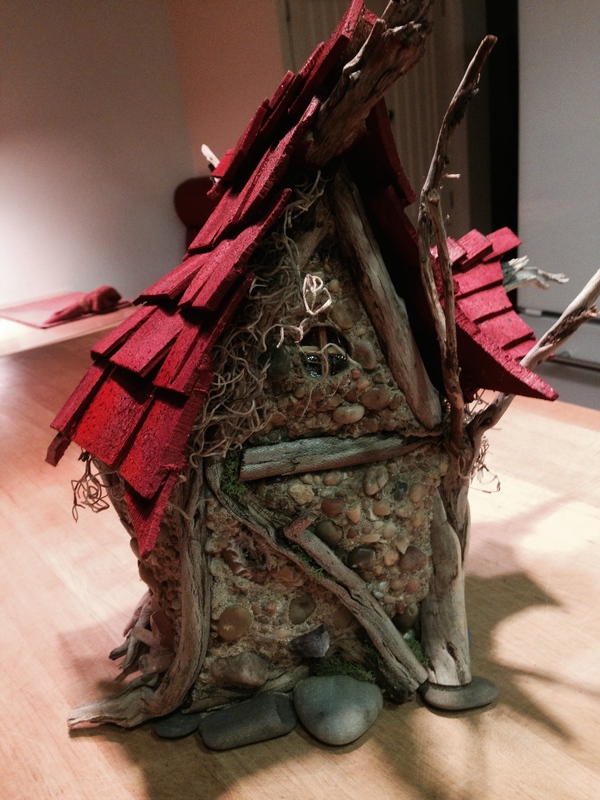 This is Whistlebinkie, a fairy house that exudes powerful female energy. This cottage is especially attuned to women, (or men who have a deep appreciation for women). Where did I put that pen? It’s my favorite. It was part of my Dad’s pen set that I inherited when he passed away. It’s silver-colored, and has a slight bend in the middle of it, as though little hands had tried to break it in half once. I use it for everything, and now it’s gone. The first thing I do, of course, is check the fairy altar in the dining room. The Fae love to drag small items in there. (I once found my missing glasses swinging from the chandelier, but that’s a different story.) No luck, just the usual suspects….a ceramic hedgehog dressed as Miss Tiggy-Winkle with an iron in her hand, some German fairies that look like they’ve had a hard life, and a pinecone that has a fairy living in it. And, of course, the tiny bowl of water I place there daily. Next to the bowl of water is an offering dish with half a Mounds bar in it. (Candy is a very fairy thing.) But no sign of the pen. What catches my eye is a little house sitting on the sideboard that I have recently finished. I lift off the roof, and inside the house itself is a jumble of tiny items! Most look like tiny twigs and sticks on top. This has to be cleaned out — I have a festival in a week and have to get this house ready for sale. 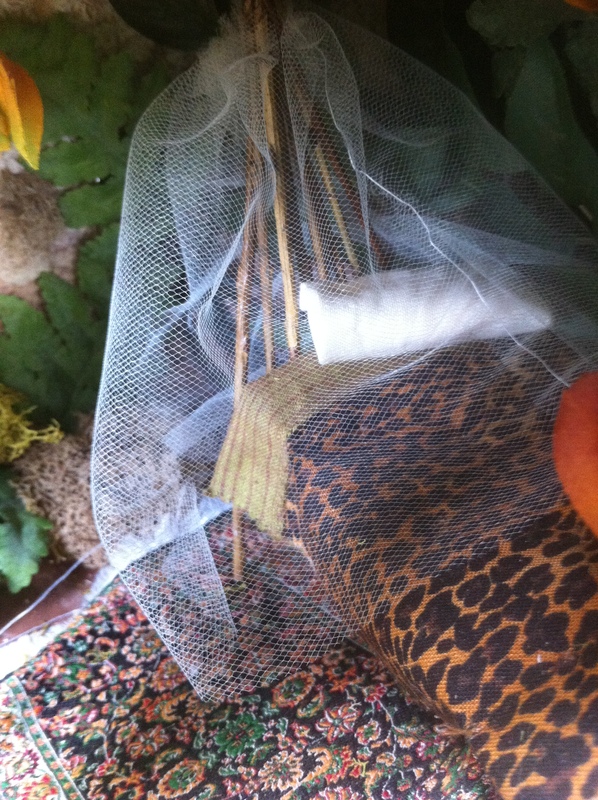 Before I reach inside, I put fresh water in the offering bowl and make an announcement softly, but out loud. I must clean out this house, and will be very respectful of the things I find there. I wait a few heartbeats, then I reach inside the house and gently start pulling out little bits of sticks and twigs, bits of cedar, my miniature pliers I won in a craft fair that had disappeared, 9 inches of white string rolled up in a neat ball, the mirror out of a compact I had thrown away about a year ago, and quarter of a dried-up peanut butter sandwich. (?) Sure enough, underneath it all was my Dad’s pen wedged upright, forming a post of sorts, that supported all those twigs. I froze, then my jaw dropped open. I had found a fairy sleeping hollow. the moment I touch this space, it will all turn to dead leaves, which is the fairy way. 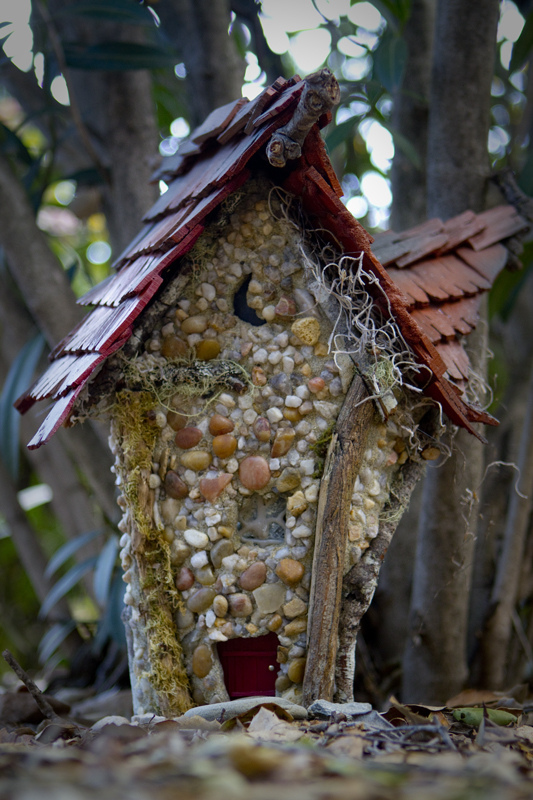 And I don’t have to worry about dismantling it because the fairy that slept there will never return to the same spot. Yet it gives me such a thrill to see the care and determination with which it was built. I gently remove the last of the twigs and free up my Dad’s pen. As if on cue, the twigs and cedar and string and pliers begin to crumble, until all that is left are a handful of dead, dry leaves in the bottom. 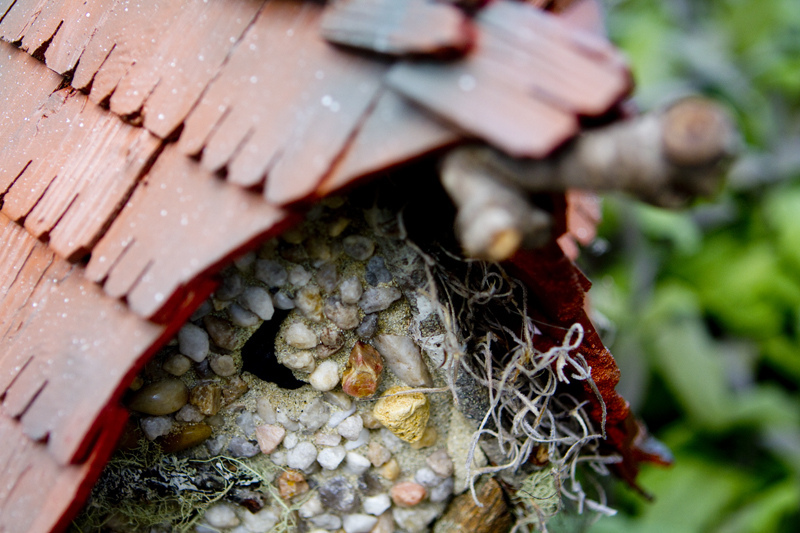 I slip the roof back into place, and that’s when the name of the house comes to me…. a “catch-all” for all things fairy. 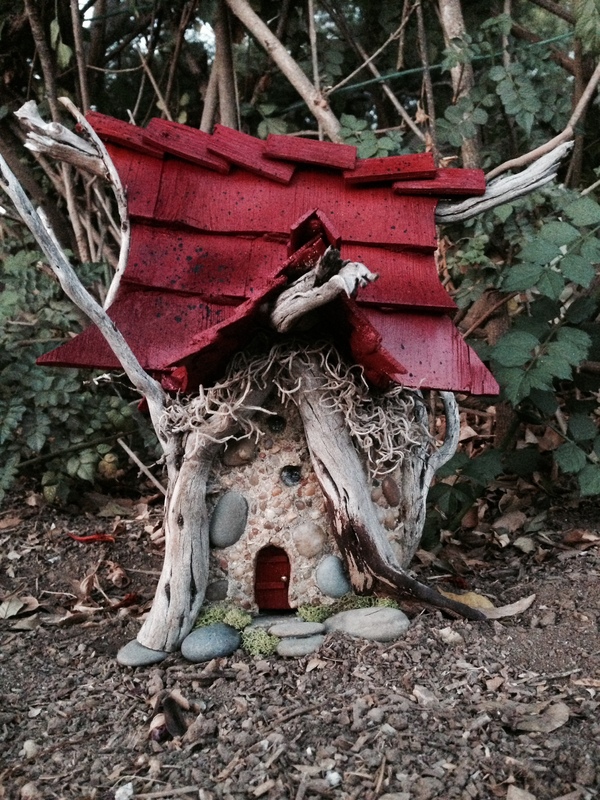 One glance at Hollis Hollow and it’s easy to see what type of fairy lives there. He is very, very tall, and very, very thin. He’s about the thickness of a sheet of paper, and when he turns sideways, he just about disappears. His name is Hollis and he is a fairy that slips easily into the in-between spaces. In-between spaces are all around us. They are the liminal times of day: sunrise, sunset. The exact moment of high tide at the shore; or the moment when the tide is lowest, seconds before it turns. It may be the threshold of an unfamiliar door. It could be that time when you awaken in a strange room and aren’t exactly sure where you are yet. Maybe it’s when you are handed a wrapped gift… those precious seconds before you tear into it. Parents will recognize that liminal moment when their baby entered the world. Some of us experience it when we sit with our loved ones as they exit this world. Perhaps it’s that moment when you close your weary eyes at the end of a long day and start to fall asleep, yet you’re not yet asleep… it’s that in-between place again. These liminal moments are intersections in the fabric of the universe… so full of promise and change. It is at this point that your life takes a small turn – for better, or sometimes, for worse. The choice is almost always up to you. Hollis guards these in-between places. He knows how sacred they are, and how much they affect human existence. He wants you to experience them. More importantly, he wants to watch you experience them. The next time you find yourself at a liminal moment, de-focus and soften your eyes. In the very far corners of your peripheral vision, you might catch Hollis slipping in to watch. It seemed like I was walking forever through the muddy meadowland on the side of a hill in Cornwall. Even to find this little path, I had to walk through the graveyard of an old church and out the back gate into miles of fields. A very large black dog sat outside the gate leading out into the fields. I’m a dog person, happy to see one of my kind out here in the fields. I clapped my hands and made little “come here” sounds, and talked encouragingly. He didn’t budge. I tried again, slapping my legs and motioning to him. Nothing. He wouldn’t come close to be petted. He just sat and watched me. The sky was overcast and the wind came up. A sure sign of rain to come. Within a few more steps, the light pattering began. Dressed in jeans and a T-shirt, I was quickly soaked. But I pressed on. Somewhere in the vast fields before me hid a tiny chapel to St. Clether of Cornwall. Most tantalizing was the thought of the well next to the chapel. Americans don’t “get” wells. To us, a well is a hole in the ground covered by a large metal plate that is impossible for anyone to lift. 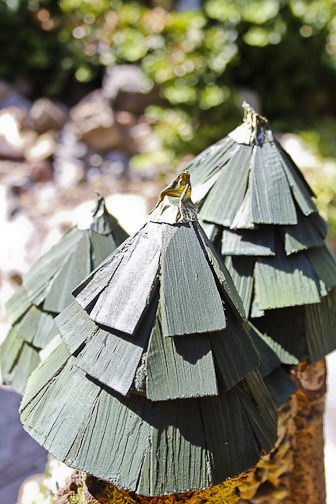 Wells are invisible things that either run underground or are found in theme parks with a cute little shingled roof, a hand-crank, and loose change in the 3 inches of water below. The Brits and the Irish know what wells really are. They know that you can be walking through a beautiful grove of deep green forest and suddenly come upon hand-hewn rock steps leading down into the earth, just wide enough for a human body. You descend into total silence in about 3 steps. You can feel the moist, cool air surround you, and as your eyes adjust to the dark, you begin to see a flickering candle or two set in little ledges of the rock wall. You are about 3 feet underground now, and at the last step or two you hear the trickle of water. Crouching down on the last step you see a small pool of clear water in front of your feet. If you look long enough, you can see where the water enters the pool and possibly where it exits the pool. The pool is usually absolutely silent and still. This is a sacred moment for the local people, and it is evidenced by the small gifts tucked into crevices near the water. They may be pieces of paper with hastily scribbled notes asking for healing, tiny statues of the Virgin Mary, coins, jewelry…anything to petition the Spirit of the Well, God, the Blessed Mother, or your higher power. The one thing that all people feel, I’m sure, is the magic of water coming straight out of the Earth, for the use of Her people and animals. These gifts and petitions are remnants of pagan practices of honoring the Spirit of the Well that have somehow made their way into the practice of everyday Christians. To a southern Californian, this is about as foreign as it gets. Water, coming to the surface? An untended CANDLE FLAME, flickering in the open?? Since fires are common and devastating here, an untended candle flame is practically asking for jail time. So the ‘foreign-ness’ of these wells intrigued me from not only a physical and geological sense, but a spiritual one as well. On a trip to Ireland I became besotted with “holy wells”, and have visited too many to count. Now here I was in Cornwall, where I happened to run into some local witches who told me I must not miss this well. The thought of a well somewhere out in the rolling fields of Cornwall was just too much to resist. I pressed on. Soaked to the skin, I trudged on with no well in sight. The wind came up. And just as I stopped at a tree and was pondering turning back, it was there, behind the line of trees. A tiny fence surrounded a small, rock chapel that would hold, maybe, 10 people. Inside, it was pitch dark, so I opened the unlocked door (another foreign concept in California) wide to let in some light. Up front there was a small altar made of stone and a tiny gothic-arched window above the altar that looked out into the deep green of the trees. I immediately walked up to the left side of the altar to see that which I had walked miles to see. Through a hole in the left wall, at floor level, water came trickling through an open, rock channel about 2 inches wide. It flowed beneath and behind the altar, and then out through a hole in the right wall. Above that hole was a small wooden door. I opened the door, and there below was a small basin where the water collected before it ran underground again. That basin was on the outside of the chapel, where people could walk up to it and collect this special water, even if the chapel was locked. The energy in this chapel was peaceful, gentle, and a disarming mix of Christian and pagan sensibilities. Water is known to be affected by emotions and intention. What intention did these Christians send knowingly or unknowingly into the water flowing under their altar during their Mass? Perhaps that of peace and forgiveness? I just basked in the beauty and the energy for a bit, before the long walk back. Outside and tucked behind the chapel was St. Clether’s Well, a small, box-like structure of rock around the water coming up from the earth and trickling slowly toward the chapel. The entire area was well-kept and tidy, even down to a small bench with a hummingbird feeder next to it. Clearly the locals were taking good care of this amazing place. As I left through the tiny gate, I saw a stack of wood that had been cut and cleared from the many trees around the chapel. There was energy and vibration in that wood, so I collected a couple of pieces of it and brought it home to my studio in California. 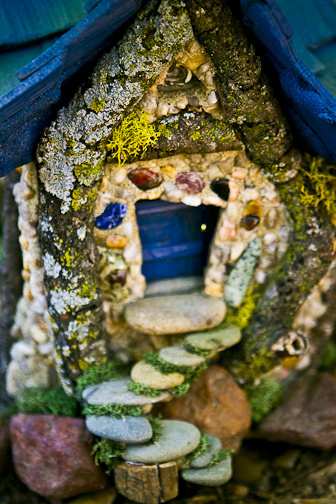 Once home, I began to think about the faerie world, and how there are many representations of our physical world there. What would St. Clether’s Well in Faery look like? 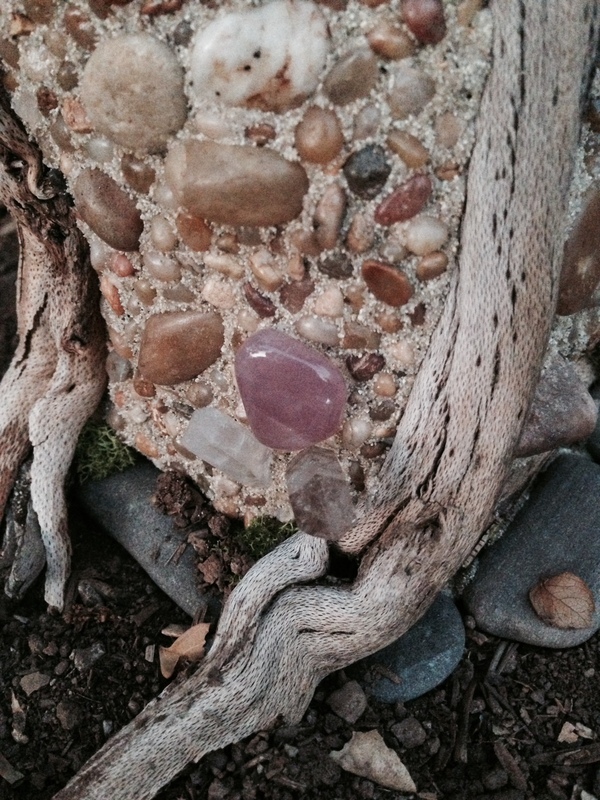 I lifted the pieces of wood that came from the chapel yard, and asked the faeries to guide me. 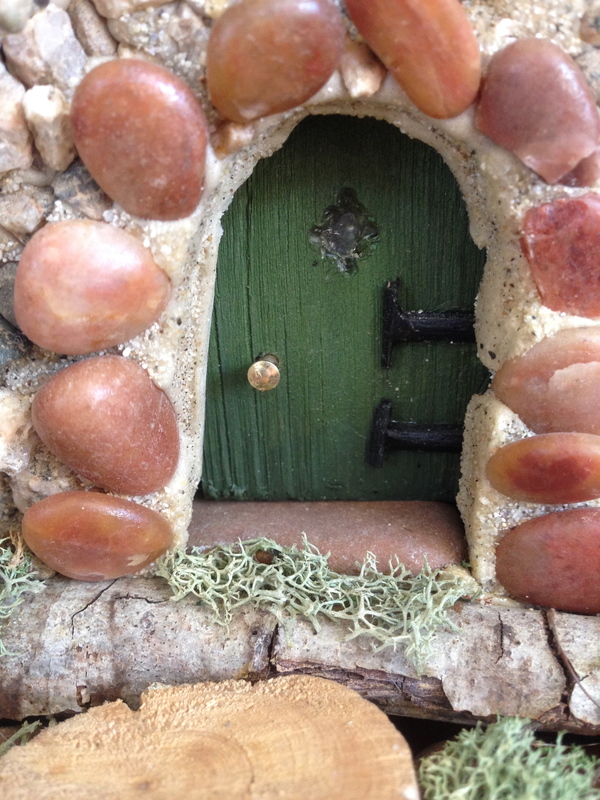 This, then is the faery version of St. Clether’s well.